Not surprisingly our trip to Rio for the World Cup has been mainly centered about soccer, I have actually watched more soccer over the last month then I have in my entire life. Everything about the World Cup (going to the games, cheering on Brazil with locals in the streets, watching the US play Belgium with a huge group of Americans at the Budweiser hotel) has been incredible. But last Tuesday marked the end of the group stage and I was a bit excited that there were two rest days before the quarterfinals began. No games meant that we could venture out and experience some different parts of Rio on Wednesday and Thursday. When we woke up Wednesday morning it was cloudy, so we decided that we should wait to see Christ the Redeemer when it was sunny so that we could see the amazing views of the city. 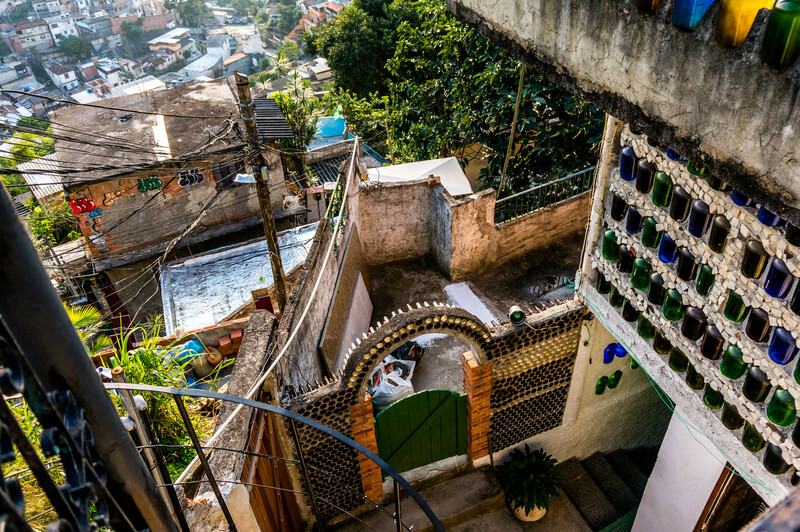 Plan B was to explore an area called Santa Teresa and then head to Lapa to visit the famous Selaron staircase. I am not sure that anyone else in our group was even interested in Santa Teresa or Lapa, but I convinced everyone that is would be great. We headed to the bus station, asked several different bus drivers which bus to take to Santa Teresa and finally found one which we believed would take us to where we wanted to go. The bus system in Rio is extremely confusing, there are numerous different companies and lines. But the bus drivers are always helpful, even though Wes and I don’t understand a word they are saying. It turned out that we had to switch buses and luckily I sat next to a very nice lady, who spoke a bit of English and told us where to get off. The second bus took us on a wild ride up an extremely narrow, winding street. If we had spent much longer on the bus, I am sure that I would have gotten sick. We arrived at the stop where the woman next to me told us to get off and she instructed us to walk down the road approximately 15 minutes and we would get to Santa Teresa. At this point we were all happy to get off the bus and walk. We started walking along the narrow road, following the tram tracks where a “San Francisco” style yellow tram once ran up and down the streets of Santa Teresa and connected it to the Lapa district. It was my original plan that we would ride the tram to Lapa, but we realized pretty quickly that the tram was no longer running. I did a little research when we got home and I guess a train derailed in 2011 and although it was supposed to be running again by 2014, the work to repair the tram line is very slow. Although I was bummed about the tram, I really enjoyed slowly strolling through the streets, admiring the views of the houses lining the hillside and the city below. We stopped to get snack at a little shop, walked a little further and then decided to find a bus to Lapa. One more bus ride later and we made it to Lapa. I quickly asked someone for directions to the Escadaria Selaron, which was just a couple minute walk away. We arrived at the steps just as the sun was setting and found that the steps were filled with people. This is a very famous place to take pictures in Rio, but the number of people on the steps still surprised me. 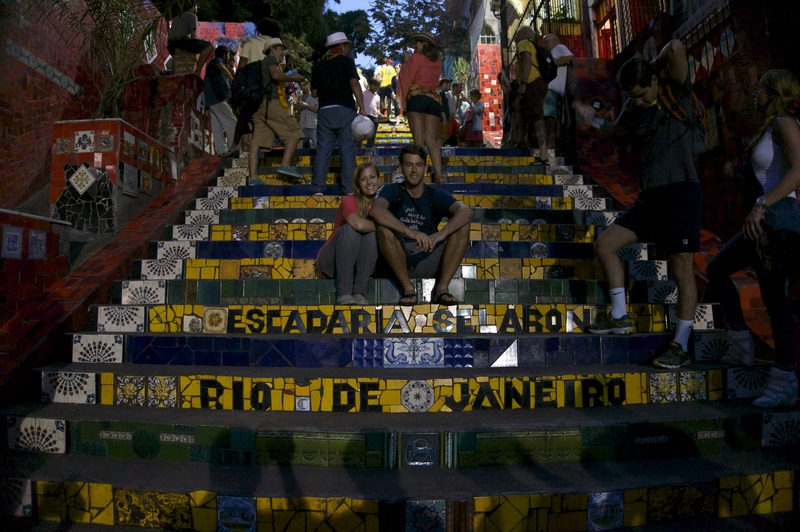 People were taking turns sitting in the center of the steps, directly above the “Rio de Janeiro” mosaic. We waited our turn and quickly jumped into take a picture and then decided to walk all the steps. The stairs are lined with houses on both sides and they are covered with different colorful mosaic tiles from all over the world. We spotted a Las Vegas tile and a Utah tile, but had no luck finding an Oklahoma one. There was a group of men playing music and children going in and out of the houses. It truly is a beautiful scene. We made our way back down the steps and headed towards a restaurant/bar that we had seen on our way towards the steps. We pushed tables together for our big group and sat outside to enjoy the beautiful night and culture found in Lapa. I ordered a Maracuja Caiprivodka, which is a vodka drink with real passionfruit (difficult to drink due to the seeds, but quite delicious) and many others ordered Caipirinhas, which is Brazil’s national cocktail made with cachaca, lime and sugar. We enjoyed the drinks while taking in the rich culture present in Lapa, we even saw a transvestite parade down the main street. 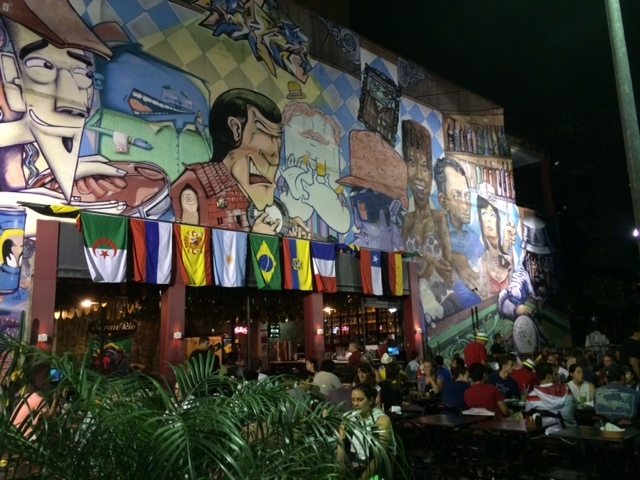 Lapa is an extremely lively part of Rio, filled with energy and night-life. I was told that if you visit Lapa on a Friday night, it’s just one giant street party. 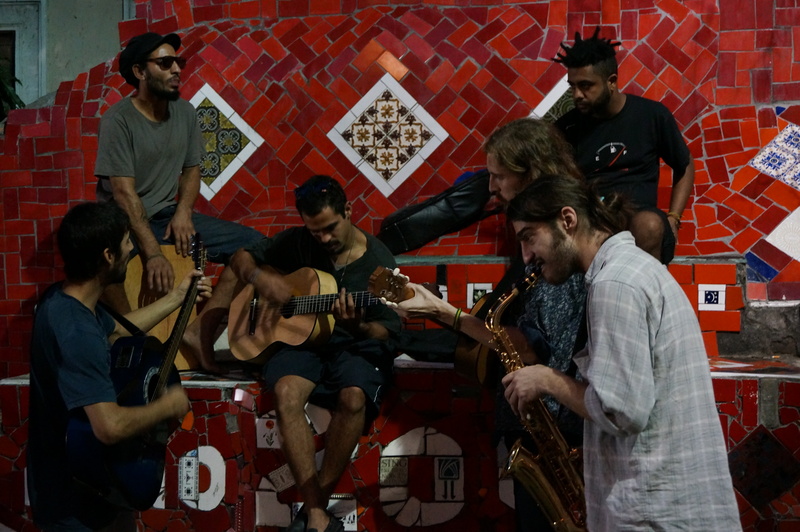 Although we didn’t visit Lapa on a Friday night, we have experienced the street parties in other parts of Rio. 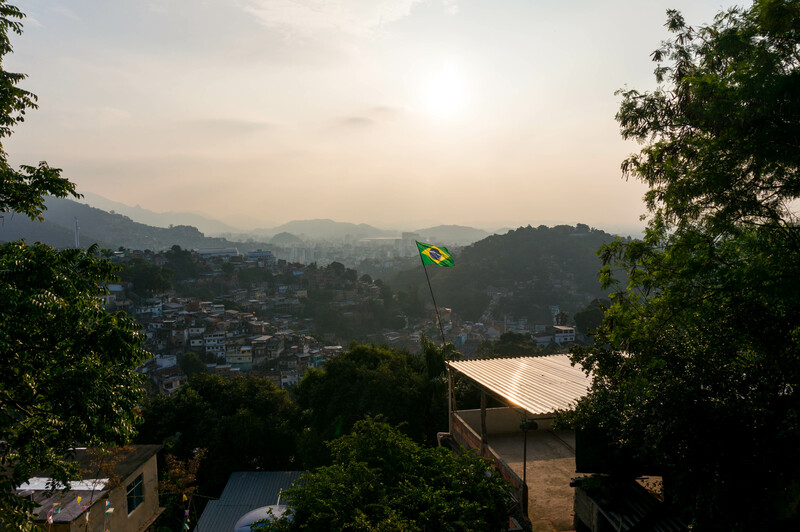 I loved this day exploring and getting know these other areas in Rio, it is most definitely one of the many highlights of our stay in Brazil. What a fun time! I just can’t get over the beautiful pictures. So happy for you guys!